The Concerto for two pianos in D minor, composed in the summer of 1932, ranks alongside the Concerto for organ, strings, and timpani (1938) as Poulenc’s finest works in the arena of orchestral music. Poulenc recognized what he had accomplished upon the work’s completion; he wrote to a friend, 'You will see what an enormous step forward it is from my previous work and that I am really entering my great period'. Poulenc premiered the Concerto in September 1932 with pianist and childhood friend Jacques Février, at the Fifth International Music Festival in Venice, with the La Scala Orchestra, conducted by Désire Defauw. The Concerto betrays various influences. The composer acknowledged as much in a letter to the composer Igor Markevitch: 'Would you like to know what I had on my piano during the two months gestation of the Concerto? The concertos of Mozart, those of Liszt, that of Ravel, and your Partita.' Along with these, the sound of Balinese gamelan, which Poulenc had encountered at the 1931 Exposition Coloniale de Paris, was evidently in the composer’s ear. Following its declamatory opening chords, the first movement launches into a motoric sixteenth-note passage, fortissimo, très brillant, which evokes gamelan’s exotic harmonies. The tempo soon picks up, conjuring images of leaping aerialists. 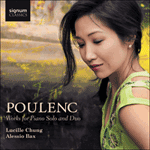 Later, the music slows to a romantic lugubriousness—maudlin, perhaps, in the hands of another composer, but cut along Poulenc’s razor-sharp wit, such schmaltz is perfectly self-aware, and gleefully so. Gamelan harmonies surface again near the movement’s end, now très calme. 'In the Larghetto of this Concerto', Poulenc wrote, 'I permitted myself, for the first theme, to return to Mozart, because I have a fondness for the melodic line and I prefer Mozart to all other musicians. If the movement begins alla Mozart, it quickly diverges at the entrance of the second piano, toward a style that was familiar to me at the time.' The soft lullaby that begins the Larghetto might specifically call the mind the Romance from Mozart’s Piano Concerto in D minor, K466. As the music becomes more turbulent, it nevertheless gives little impression of turmoil befalling the idyllic scene; rather, it suggests only a distant threat—perhaps the dark turn in a fairy tale, told in the nursery before bedtime, which will effortlessly find its way to a serene conclusion. The Concerto’s vivacious Allegro molto finale is paced by a fleet repartee between the two pianists. The music passes through various episodes of contrasting character, but Poulenc’s irrepressibly devilish humor prevails throughout. A brief remembrance of the first movement’s gamelan passage colors the final moments of this fetching Concerto.